It's all about health tips, education information, traveling information, Sport Information, Science and Technology Information. Oprah, the second most famous person in the world, had Susan Boyle, the most famous person in the world on her show today (Monday May 11, 2009). Susan Boyle opened her house and welcomed the Oprah film crew in to give the world a glance at how she lived. Susan told Oprah that she has been singing all of her life, except for one small break when her mother died in 2007. "After that, there was a wee period where I didn't sing," she said. She said she began singing when she was 9, to compensate for a learning disability. "I was kind of a slow learner at school, so getting something like singing was a good way of hiding behind that and so boosting my confidence," she said. Susan is loving her new found fame, off the back of the reality show Britain’s Got Talent. "It's like a dream come true," she says. As for recent makeover, she denies it was one. "It depends what you mean by a makeover," she says. "I said to my best friend, I said, 'How's about you do my makeup?' I mean, that's hardly a makeover." Susan Boyle rose to fame only 5 weeks ago when a “gobsmacking” performance of ‘I Dreamed A Dream’ on Britain’s Got Talent. Every week since, the producers of the show have tried to throw a competitor in to trump Boyle’s performance but has so far failed to achieve their sidetrack. This week, the musical equivalent of the bearded lady, a male opera singer who looked like a rock star and sounded like a woman won the show. They have tried a male Susan Boyle, a cute kid dancer and a boy who sounded like Michael Jackson but the fact is that once their 15 minutes of fame was over, no-one remembered their names. None of them were a Susan Boyle. Boyle’s sudden fame surprised the show’s Simon Cowell, who didn’t allow her to sing on the Oprah show this week, claiming it was an unfair advantage over the other contestants. Cowell spoke highly of Susan. "You've got practically the whole world behind you now," he says. "So I want to say congratulations and wish you the best of luck." Susan, the youngest of nine, says she started singing when she was 12 years old. Music, she says, helped her cope with a learning disability. "I was kind of a slow learner at school, so getting something like singing was a good way of hiding behind that and so boosting my confidence." Susan says her biggest supporter was her mom, who died in 2007. "After that, there was a wee period where I didn't sing," she says. To help cope with the loss, Susan says she auditioned for Britain's Got Talent. "I am very slowly getting over it," she says. "One of the reasons I applied for the TV show was to try to see if I could perform in front of an audience." Susan says she's embracing every moment of her newfound fame. "It's like a dream come true," she says. Despite constant public scrutiny over her appearance, Susan says she hasn't had a makeover. "It depends what you mean by a makeover," she says. "I said to my best friend, I said, 'How's about you do my makeup?' I mean, that's hardly a makeover." Though she cut and colored her hair, Susan says it wasn't part of a dramatic transformation plan. "I did a bit, but that was just to tidy myself up like any other female would have done," she says. No matter what, Simon says the competition is all about Susan and her voice. "You've got practically the whole world behind you now," he says. "So I want to say congratulations and wish you the best of luck." 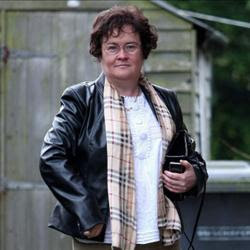 What Do You Think About The Makeover Of Susan Boyle?? It may seem like the contest is over. For many weeks, show enthusiasts (myself included) have speculated Adam Lambert would — or, at least, should — win this season of American Idol. Of course, way back in Season 2, I was just as certain Clay Aiken would walk away with the title. And that didn’t happen. So, don’t count out Kris Allen. The show is not over until the sparks fly and the confetti falls. Many people are angry Danny Gokey did not make it to the finale. My e-mail inbox has been flooded with feedback from fans swearing they will never watch another season, because they just know this show is rigged. Sorry, folks, but I think the producers can stand to lose a few viewers and be just fine. After all, 88 million votes were cast this week. And the show still remains to be the top-rated — by a mile — week after week. Plus, they have given several finalists record deals, so I don’t think they really care who wins these days. Adam has been consistent since the beginning. He has that extra spark that makes him stand out — in a good way — from the other contestants. He can really, really sing anything. And he’s entertaining. You never know what you will get from an Adam Lambert performance until he opens his mouth, and that’s worked for him to this point. He already has been featured on the cover of Entertainment Weekly. I believe (don’t quote me, though) this is the first time an Idol finalist has gone solo on a major magazine cover before that season’s winner has been crowned. Now back to the singing. All you have to do is take one more listen to Tracks of My Tears, one of his best performances, and you will understand why Adam is this year’s leader. Or search for any of his performances. He has been on top of his game from the start. There are some things that could really be working against Adam, too. Katy Perry wore Adam’s name on the back of her Elvis-inspired cape during Wednesday’s results show, which also serves as a ringing endorsement from a top-selling artist. Of course, this also is being seen by many fans as a way to “brainwash” the viewers into choosing Adam. Plus, and I hate that this matters, there is the question of his sexuality. While Adam has not confirmed or denied rumors of his sexuality, there have been plenty of pictures released of him kissing other men. It hasn’t hurt so far in the competition, but now is certainly the time it could. He’s the dark horse in the competition, and that could be a good thing. Since the beginning, Kris has been moving slowly uphill with momentum. In the early stages of auditions, he didn’t really stand out (ala Kelly Clarkson), but he’s grown more and more each week into a true artist. Speaking of Danny, Kris also is more in line with that conservative style. He doesn’t wear guyliner, and his style of music and wardrobe matches more closely. 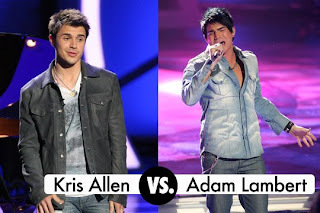 And that means the transfer of Danny votes could really sway this thing into a shocking Kris Allen victory. But, again, I return to the music. If you don’t think Kris Allen has a fighting chance, check out his version of Falling Slowly. That, to me, really proved he could be something big in the industry. There are some things that could really be working against Kris Allen, too. Mostly, the fact he isn’t Adam Lambert. Adam Lambert (born January 29, 1982) is an American actor and singer from Los Angeles, California. He is currently a finalist on the eighth season of American Idol. Lambert grew up in Rancho Peñasquitos, San Diego, California and attended Deer Canyon Elementary School, Mesa Verde Middle School, and Mt. Carmel High School, where he was in theater, choir, and a jazz band. Lambert has been a stage actor since he was about 10 years old; he was cast as Linus in San Diego`s Lyceum Theater`s production of You`re a Good Man, Charlie Brown. He also played a part in The Ten Commandments at the Kodak Theatre alongside Val Kilmer. He was the understudy for the part of Fiyero in the touring and Los Angeles casts of the musical Wicked. Since 2004 he regularly performs at the Zodiac Show, which was co-created by Carmit Bachar of the Pussycat Dolls. He also performs at the Upright Cabaret. Lambert auditioned for the eighth season of American Idol in San Francisco, California. During his initial audition he sang Queen`s "Bohemian Rhapsody". Both Kara DioGuardi and Simon Cowell criticized him for being theatrical, however he moved on to the Hollywood rounds. In Hollywood, Lambert sang Cher`s "Believe", a risky song choice which paid off for him in the end as he made the Top 36. For his semi-final performance he sang The Rolling Stones` "(I Can`t Get No) Satisfaction". All the judges praised him; however, Simon remarked that parts of it were "excruciatingly bad" while other parts were "brilliant". He called it a "love it or hate it performance". Following that performance, Lambert was voted into the Top 13. On Michael Jackson week (Top 13), he sang "Black or White" leading to praise from all four judges. After his Top 13 performance of Black or White by Michael Jackson, judge Paula Abdul predicted that he would go on to be the winner or runner-up of the competition. The following week, Lambert sang a modified version of Johnny Cash`s "Ring of Fire". While Randy, Paula, and Kara all liked his performance, Simon called it "indulgent rubbish". On Motown week (Top 10), Lambert distanced himself from the prior week`s performance, singing a slowed down, acoustic version of The Miracles` "The Tracks of My Tears". The judges all liked it, with Simon proclaiming that he had really emerged as a star that night. Smokey Robinson, Motown week`s mentor, gave Adam a standing ovation. The next week he sang Wild Cherry`s "Play That Funky Music". Simon praised him on his brave performance, while Paula described him as a "true genius" whose performance "shattered expectations". For his Top 8 performance (Year You Were Born) Adam sang the 2001 Gary Jules` arrangement of "Mad World", a song written and performed by British band Tears for Fears in 1982. Because the show had exceeded its time slot, only judge Simon Cowell gave a critique, which he did by simply giving Lambert a standing ovation. The next night, the other judges agreed that a standing ovation was the best critique of Adam`s performance. Adam Lambert, Danny Gokey and Kris Allen are the only final contestants not to have been in the Bottom 3, and Now They are ini Final Top 3 American Idol. Adam Lambert: "I Know Who I Am"